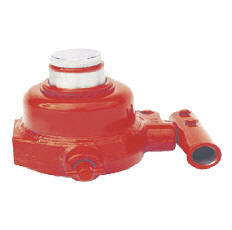 A compact, powerful jack with a very low profile that is ideal for installing and/or centering heavy equipment. Makes fine adjustments easier when working in close quarters. 1. Compact and powerful with a very low profile. 2. Small size is ideal for centering heavy equipment or making fine adjustments. 3. Can be used in conjunction with a mechanical gear puller to create a hydraulic puller with over 5 ton capacity. 4. Can also be used as a spreader to apply force with just over 2-1/2" of clearance needed. 5. Use in either an upright or horizontal position. 5 ton Mini jack, compact 2 1/2"
5 ton Mini jack, Tall 3 3/8"